Creepy crawlies are trying to eat the flowers in the greenhouse. 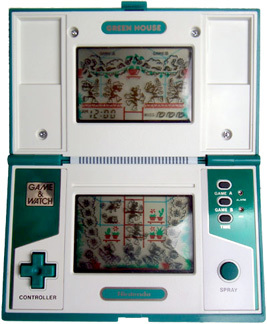 Spiders creep towards the flowers on the bottom screen while inchworms crawl across the top screen. Move the Fumigator between the two screens and spray the bugs before they reach the flowers. When you spray a spider and it takes a step back you score 1 point, while killing the spider scores 3 points. You score 3 points for hitting an inchworm when it is closest to the flower, 2 points for 2 steps away and 1 point for other positions. When a flower is eaten by a bug you get a miss. Three misses and the game ends. At 300 points all misses are cleared.